I have very little information about this movie that I saw last night. I only found out that there was a new movie premiering on our usual Wednesday one day before. When I saw the synopsis, I immediately felt it would be an interesting film to see. Especially since the major Hollywood movie that was already playing in US last week would only be playing on Friday (yes, I am talking about A Wrinkle in Time). Although this movie did not get much publicity in Indonesia and I never saw the trailer earlier, it truly intrigued me. And my wife also happened to be available to join me this time. Well we shall move on to the movie now. 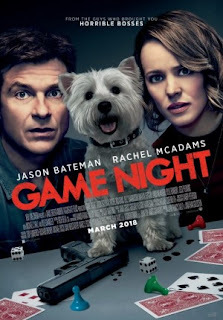 Max (Jason Bateman - Horrible Bosses, Arrested Development TV series etc) and Annie (Rachel McAdams - Doctor Strange, The Notebook etc) were a suburban couple who loved to play any type of games and were very competitive. Every week they would have a game night at their house with their best friends Kevin (Lamorne Morris - New Girl TV series etc) and his wife Michelle (Kylie Bunbury), and also Ryan (Billy Magnussen - Into the Woods, Ingrid Goes West etc) who always brought different date on every game night. Max and Annie's neighbor Gary (Jesse Plemons - Black Mass, Fargo TV series etc) who was a divorced cop, always wanted to join them in those game nights but was not invited. On one of those game nights, Max' brother Brooks (Kyle Chandler - Manchester by the Sea, Early Edition TV series etc) who was in town, asked them to have their game night at his house. But unlike the usual charade or board games, he suggested a different kind of game. It was going to be a kidnap mystery game where one of the players would be kidnapped and they have to solve the mystery in certain amount of time. However things went completely awry when the kidnap turned into a real one and the gang including Ryan's date for that night Sarah (Sharon Horgan - Catastrophe TV series etc) had to solve the mystery before anything really bad happened. So could all of them solve it in time? How could a real kidnapping be happening? Find them all in this hilarious comedy drama movie. OMG, this movie was amazingly funny. My wife and I had not had this kind of serious laughter throughout the movie for quite some time. Probably the last time we had these moments were when we saw Warkop DKI Reborn: Jangkrik Boss Part I or The Mermaid. The movie started off with some few smart jokes and continued with the more fun moments involving most of the lead characters. The major funny moment where we really laughed out loud was the scene involving Max and Annie in the back of an alley. My wife literally laughed till she cried and all the audience were having the best time as well during that moment. The rest of them were also fun as hell, like Kevin and Michelle's small "problem" or Ryan's unusual "naivety" or Gary's total weirdness. Make no mistake though that behind all those funny moments, the movie actually had some drama about brotherly relationship or the issue of having kids and the mystery was quite real. But of course the main attraction of the film would definitely be the many hilarious moments. Even the end credit scene was having fun things to look at. Aside from those quality, the movie also had few unique way of showing things related to games, such as the tiny model houses, cars and characters figures or the nonstop scene of capturing the egg in the middle of the movie. I truly believed that the directors of the movie John Francis Daley & Jonathan Goldstein were really great in making this comedy movie. No doubt it was due to their experience as co-writers of Horrible Bosses & its sequel, plus directing National Lampoo's Vacation. They even were part of co-screen writer for Spider-man: Homecoming. With such CV, obviously they have a bright future ahead of them and I would look forward to other movies that had these two's names on it. Btw, they did appear as cameo in this film as Carter and Dan (which surprised me coz I could not remember their characters, especially Daley since I should recognize his face from Bones TV series that I saw till finished). Aside from the wonderful performance of the cast which I found very fun to see, it was also surprising to see there was a brief performance from Michael C. Hall (you would have known him as Dexter in that famous psychopath serial killer TV series) in this comedy movie. Although he did not provide fun moment, but he really suit the character he was playing. One thing that bothered me and my wife was the scene involving him and the gang that we believed was a bit non sensical, but it was very minor that we could totally waive it. And the multiple twists though could be guessed, but still quite OK. So in the end, if you are looking for a funny movie with dark humor and you want to have a good laughs with your friends, family (but I am sure the jokes were more suitable for adults), spouse, co-workers basically anyone who appreciate good comedy movie, you would totally be satisfied. I am sure you would have enjoyed it as much as my wife and I did. But if you do not like this kind of comedy movie and you prefer the kidnap & mystery to be truly a brainy one, then this would not suit you at all. The choice is yours.